I like to think of myself as an active proponent of remix culture. I praise people who share their work with Creative Commons licenses that allow reuse, and I try to license my own works the same way. So if you want to take the words of this post and rap them over a beat you made, you can legally do so without needing to ask me, as long as it’s not a commercial venture, you give me credit for the original, and you use the same CC-BY-NC-SA 3.0 license I use on my site. 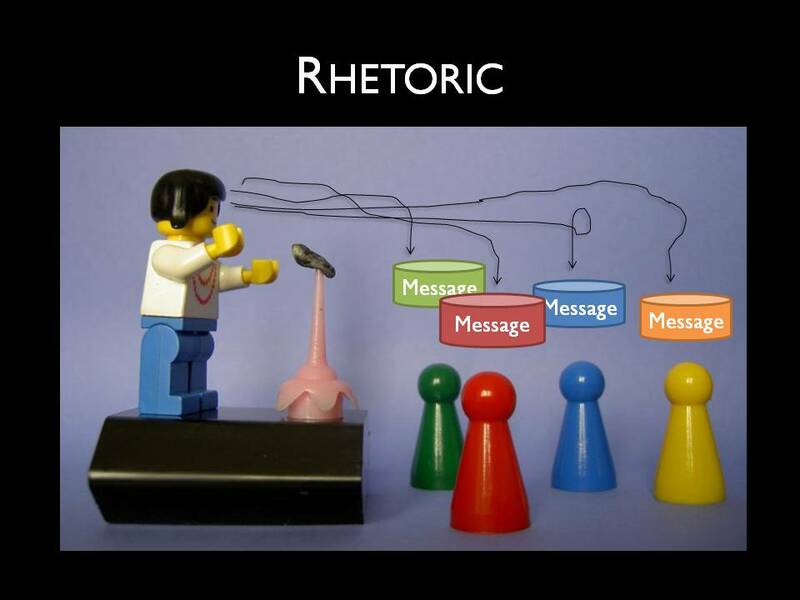 Why study rhetoric? Because so many people so often seem to have no no no idea about how to communicate well. Why study rhetoric? Because, communication is difficult, and even more difficult if we are not rhetorically aware. I don’t want to sound too complainy, though–there was a lot of good work done to my piece, too. Many of my small errors were fixed, and plenty of my wordinesses (which I tend to drown in) were smoothed out beautifully. And hey, my piece was in a textbook for like 7,000 students! Rock on! What does this have to do with authorial control? It gives you a sense of my attitude toward the piece as it grew into its next iteration, and as I locked the piece further and further into my mind as mine. Writing Commons graciously worked with me through these changes, and I now have this new version up at their site (where perhaps many more than 7,000 students will find it helpful), peer reviewed and all. Even better: Writing Commons uses the same Creative Commons BY-NC-SA license I use on my blog, and I retain copyright over the piece. I love the idea that someone who found this piece helpful can print copies out, make a video of it, cut out the pieces she finds most helpful, and so on–and all legally (again, as long as she follows the guidelines of this particular CC license). But the Writing Commons contract also includes an interesting optional clause: essentially, they wanted to know if I’m okay with other Writing Commons authors updating my piece later on. If I checked yes, I would always be first author, but later revisers would be included on the list of authors. This clause makes sense, especially given how quickly pieces can age and need updating, sometimes at times when the original authors can’t be contacted. If someone brilliant came along and wanted to add a few new paragraphs to my piece on rhetoric as freestyle rap, they would be able to, as long as Writing Commons allowed them to and as long as I checked yes. And this mental defensive posture came about five seconds after I was congratulating myself on being so open, such an example of young scholars who embrace Creative Commons and the “some rights reserved” mindset, so morally superior. As angry as I still am, however, I confess that after two years of thinking and talking about being the victim of a chronic plagiarist, I sometimes wonder if I shouldn’t have simply let the matter drop. In the end, my efforts to obtain justice have yielded few results; and I am not materially worse off than I was before my work started appeanng under someone else’s name. Thinking back now, I realize this was at least a little uncharitable of me. It’s not like I’ve never felt I owned words before. I like writing, and I’m good at it; there have been plenty of pieces that I want to put my arms around and grasp, and if someone published them under another name, I would probably lash out with sudden Wolverine claws to protect my children. But when I first read Bowers’s piece (which apparently he expanded into a book? 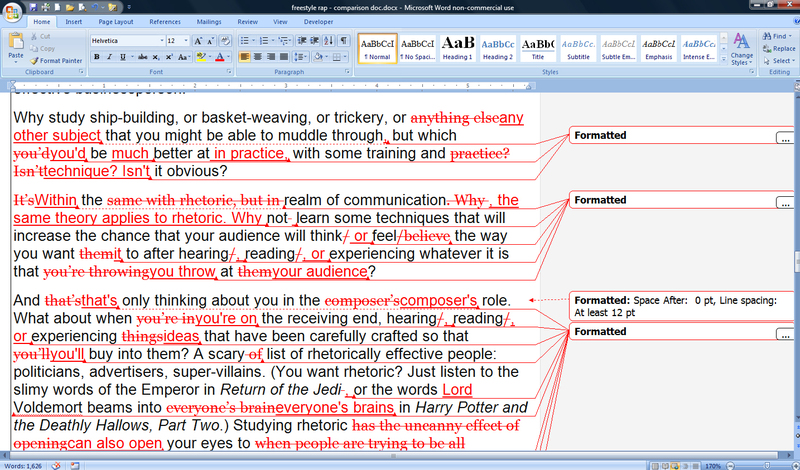 ), I was just getting excited about all the possibilities for purposefully losing control over writing. Authors like Kathy Acker and Jonathan Lethem and Dave Shields who blatantly create new, awesome things from the work of others, showing the claims of “I WROTE THIS JUST ME AND ONLY ME FOREVER WITH NO INFLUENCE” to be as flimsy as theorists have been suspecting for a long time. In many ways, my thoughts on this stuff haven’t changed. I know that even my piece on rhetoric and freestyle rap isn’t as “original” as I feel it is: folded into it is something of Geoffrey Sirc’s ethos and the style of countless other essayists I’ve admired. The format of using clearly marked section breaks of varying length is absolutely stolen, but I’ve stolen it so often I have no idea where I first came to love it. Even the basic concept of seeing rhetoric as akin to freestyle rap was suggested to me long ago when I first learned–and this was a groundbreaking moment for me–that Homer’s poetry was performed orally by poets remarkably like freestyle rappers, who had a series of stock phrases in their mental storehouses that they could improvisationally (improvisatorily?) pull out when they needed them during a performance. I didn’t acknowledge this source in my essay. Heck, I didn’t even realize it was there until just now, as I consciously plumbed the influences that went into that thing, that collection of words that I love so much and want to protect. I’m putting together my PowerPoint for the Remake | Remodel conference in Germany in a couple weeks, and I thought I’d share my two favorite slides so far. Then I’ll point out that the reason I’m interested in fan remixes is because the rhetorical effect of a text is complicated when the text includes aspects that the audience has seen/heard before. But that uncertainty is managed in part by fan communities, where the norms and literacies of the discourse community are shaped and tweaked and learned. That’s one reason I like this image so much: in a sense, I’m “remixing” the original Creative Commons licensed photo from Flickr, “orator” by southtyrolean. And people’s reactions to the image will be affected by their own history with Lego bricks–for some (like me), it’s an instantly nostalgic, familiar image because of the Lego element, but for others it might look childish, odd, etc. In other words, the image itself demonstrates my justification for talking about fan communities in my presentation. Of late, I’ve been increasingly surprised and impressed with the variety of disciplines I’ve been tiptoeing into–a natural side-effect of reading about intellectual property, remixing, and the changing face of writing. It’s great fun . . . but I also get the impression that we rhetoric/composition folks dip into our friends’ pools more than others drop by to swim with us and see what we have to say. Is that just me? Not to get all defensive or anything. . . . I was directed to a stellar post, “Will Social Media Consultants Practice What They Preach?” by Alexandra Samuel, CEO of Social Signal, a social media consulting firm. (“Hey business X! Be hip! We’ll help!”) Basically, she’s announcing that she’s tired of social media consulting firms touting the importance of freedom, openness, sharing, etc., without actually stepping up and being free and open themselves. To that end, Social Signal is going to start giving away their intellectual property under Creative Commons licenses, sharing their ideas and previous work for free, as long as people agree give credit, not turn around and sell it, and use a similar license if they post it at their own site. What I especially like here is the group admitting how terrifying a process this can be, but going ahead and doing it anyway. I mean, look at me, a graduate student in (at least at my university) a subdiscipline of English studies. I’ve never had the need for social media consulting, but all of sudden, because of this choice of theirs, I firmly have their company’s name hovering in my brain. The first time I come across someone needing this kind of service (and my wife, working in the nonprofit arts sector, surely knows lots of groups who could use some serious consultations), Social Signal will come up in the conversation. This business move is a recognition of the natural way ideas move; it’s not a replacement for making money, but a more real way of making money. I love it.